Joanne Mambretti had been to every state in the country, save one – Alaska. She had planned a birthday trip to finally check it off her bucket list when a breast cancer recurrence made her too ill to go. That’s when a group of Alaska and Menzies Aviation (Alaska’s ramp, passenger and cargo handling service) employees decided to take Alaska to Mambretti in Minneapolis. Mambretti’s friend, Eileen Manning, reached out to Alaska Airlines after the trip had been canceled. Manning and a few friends were putting together an Alaska-themed party for Mambretti. They found Alaskan-themed decorations including a totem pole and an inflatable whale. They also designed a glacier martini bar and some friends cooked imported reindeer dishes and moose burgers along with Alaskan salmon and beer. While brainstorming what other props would make the party special, Manning and her friend, Anita Barnett, decided to visit the Alaska Airlines ticket counter at Minneapolis – Saint Paul International Airport. 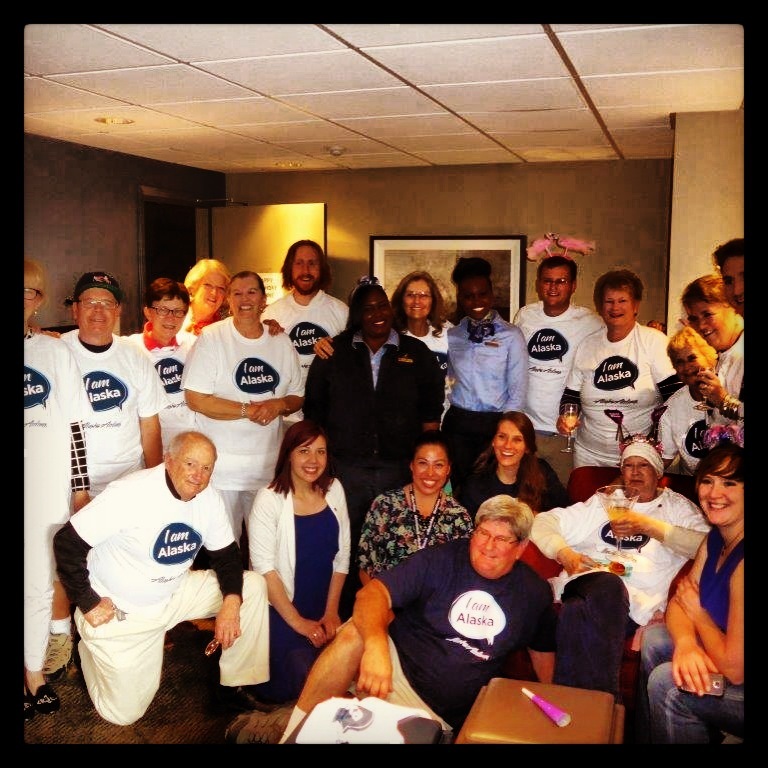 Though Barnett and Manning were only hoping for an Alaska Airlines boarding pass and some luggage tags, Paul, Minneapolis Customer Service Supervisor Nataly Benson, and a few other Alaska employees provided every party guest an Alaska Airlines t-shirt, a snack-pack and a pin. Paul also asked if four employees could attend the party to greet guests and share stories about different Alaskan cities. From left, Jamila Porter, Sara Paul, Hanna Smith and Nataly Benson attended a birthday party for Joanne Mambretti, who had hoped to make it to Alaska before she became too ill.
“They didn’t want to just give stuff, they truly wanted Joanne to experience Alaska,” Manning said. Benson and Paul were joined by two Menzies Aviation employees, Jamila Porter and Hanna Smith, to greet party attendees and tell stories about their favorite towns in Alaska. They also talked about their favorite Alaskan pastimes including watching the Northern Lights in Fairbanks and traveling to the North Pole where it’s Christmas all year round. They shared how residents depend on Alaska Airlines for food and mail delivery and how the temperature makes it difficult to breathe. “Jamila, Hanna, Sara and Nataly became the party and we got to travel through Alaska with them. They didn’t just come and make an appearance, they stayed and engaged with each of us,” Manning said, adding that the last worldly experience Mambretti ever had was her Alaskan birthday party thanks to the hard work of Alaska employees. Mambretti died on June 23, just 10 days after the party. 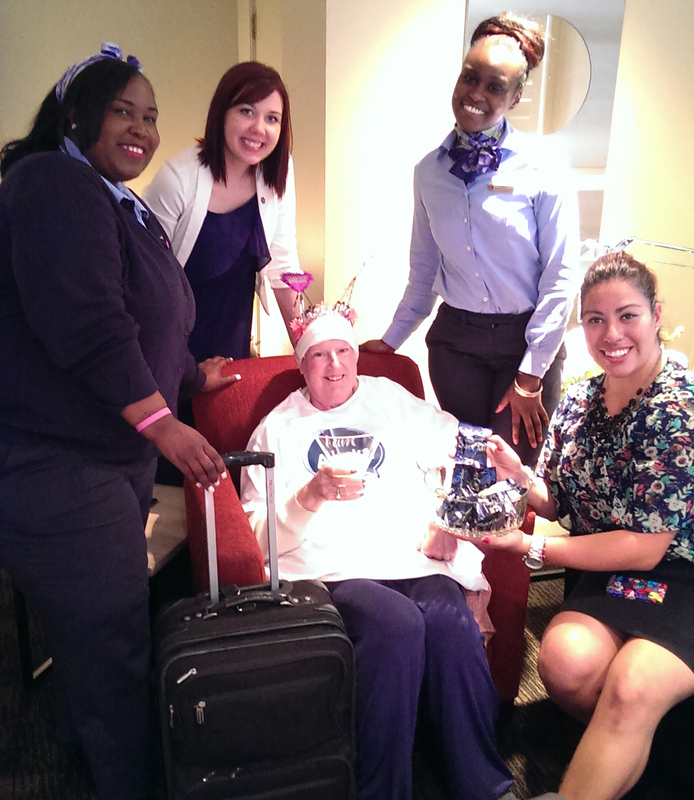 Manning was grateful to Alaska Airlines for making her friend’s final birthday special.